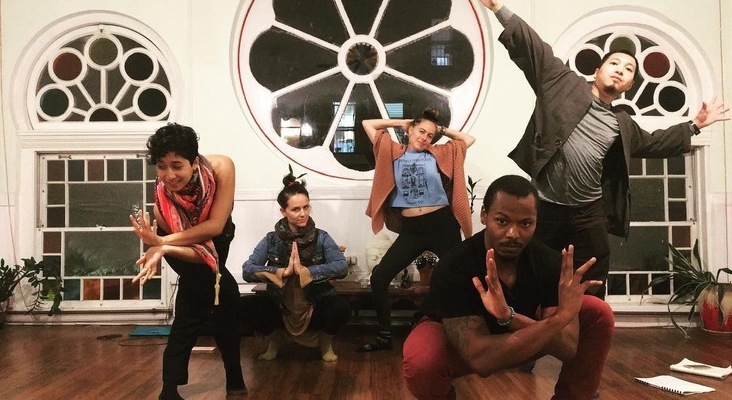 InterPlay NYC is co-led by three InterPlayers, Nandita Batheja, Darius Burroughs, and Libby Mislan, who participated in InterPlay's Art and Social Change program and have gone on to pursue the leader’s training program. For the past two years, Nandita and Libby have led dozens of workshops in NYC, primarily using the third-floor sanctuary of a historic non-profit, Sixth Street Community Center, in Manhattan’s Lower East Side. In early 2018, they led a weekly six week series to fulfill the bulk of their leadership requirements. The dynamic duo, along with InterPlay Millennial Liaison Agnotti Cowie, met Darius at a magical gathering last summer in the Redwoods at a YES! Art and Social Change Jam. Darius then attended the InterPlay Millennials program and went on to do his leader training this past October in Chicago. They are all so excited that Darius is the newest addition to the NYC leadership team.